Weizmann Institute of Science, Ph.D.
Statistics, numerical methods, large-scale genomic and proteomic data analysis, biological networks and pathways, next-generation sequencing applications, data mining and computational data analysis in disease biology applications. 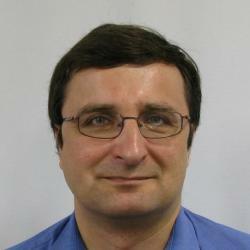 Andrey Sivachenko, PhD, is a computational biologist at Broad Institute. His experience and research interests include large-scale genomic and proteomic data analysis, biological networks and pathways analysis, and next-generation sequencing applications. He is also experienced in algorithm development and software engineering. Berger MF, Lawrence MS, et al. "The genomic complexity of primary human prostate cancer." Nature 470. 7333 (2011): 214-20. Chapman MA, Lawrence MS, et al. "Initial genome sequencing and analysis of multiple myeloma." Nature 471. 7339 (2011): 467-72. Depristo MA, Banks E, Poplin R, Garimella KV, Maguire JR, Hartl C, Philippakis AA, Del Angel G, Rivas MA, Hanna M, McKenna A, Fennell TJ, Kernytsky AM, Sivachenko AY, Cibulskis K, Gabriel SB, Altshuler D, Daly MJ. "A framework for variation discovery and genotyping using next-generation DNA sequencing data." Nature Genetics 43. 5 (2011): 491-8. Berger MF, Levin JZ, et al. "Integrative analysis of the melanoma transcriptome." Genome Research 20. 4 (2010): 413-27. McKenna A, Hanna M, Banks E, Sivachenko A, Cibulskis K, Kernytsky A, Garimella K, Altshuler D, Gabriel S, Daly M, DePristo MA. "The Genome Analysis Toolkit: a MapReduce framework for analyzing next-generation DNA sequencing data." Genome Research 20. 9 (2010): 1297-303.